____________________ SUNDAY TIMES BESTSELLER 'A thoughtful, elegant book. ... often as thrilling as a detective novel. ' - Thomas Grant, QC The Times. ____________________ Sarah Langford is a barrister. Her job is to stand in court representing the mad and the bad, the vulnerable, the heartbroken and the hopeful. She must become their voice: weave their story around the black and white of the law and tell it to the courtroom. These stories may not make headlines but they will change the lives of ordinary people in extraordinary ways. They are stories which, but for a twist of luck, might have been yours. 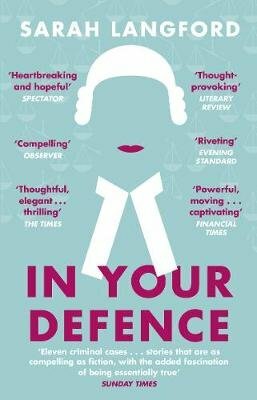 With remarkable candour, Sarah describes eleven cases which reveal what goes on in our criminal and family courts: these are tales of domestic fall out, everyday burglary, sexual indiscretion, and children caught up in the law. They are sometimes shocking and they are often heart-stopping. She examines how she feels as she defends the person standing in the dock. She also shows us how our attitudes and actions can shape not only the outcome of a case, but the legal system itself.